Mastering the art of a cover is to give the track a piece of the band that’s covering it. Some try and cover it directly, see We Butter The Bread With Butter’s cover of Big Man Shaq… But to truly succeed in covering a song, you need to create a symbiosis between bands. Following the release of their Battles album, which if you can believe it was a year ago last week (how time flies), In Flames have unveiled four cover songs on a one off EP titled Down, Wicked and No Good and its brilliant! Made up of four tracks the record open’s with a cover of Depeche Mode’s “Its No Good”. A perfect opening gambit, substituting the classic eighties sound of synth with bass and well placed guitar its a genius combination with Friden’s vocals working on a slightly lower register gives a new take on the track. Perhaps my own gripe with the record would be the final cover of Nine Inch Nails‘ original, “Hurt”. A song of that kind of magnitude, holds such deep emotional value that you could argue truly belongs to Johnny Cash from his phenomenal cover of the song. Particularly given the circumstances it was recorded in, the screams of Friden definitely hold their signature tone but perhaps make a little too much of a pastiche of the song. Yet still its an original piece that reeled me in! Alice In Chains cover of “Down In A Hole” Friden has the intimidating performance of Layne Staley to live up to. Yet the band deliver themselves in a style that is quintessentially this new In Flames sound. Though once more its the integration of Pop style covers that really surprised me. Relishing the challenge, In Flames did a fantastic job of covering Chris Isaak’s “Wicked Game”. Even before finding out the original, there were elements brought in melody that I had heard before but couldn’t quite place my finger on it. Herein lies the rub of Down, Wicked & No Good, its a great bit of fun. Hearing a band the likes of In Flames aim to cover the polarising opposites of Depeche Mode, Cash and Isaak makes it an interesting listen and the swedes have put forward four very interesting interpretations that all deserve your attention. 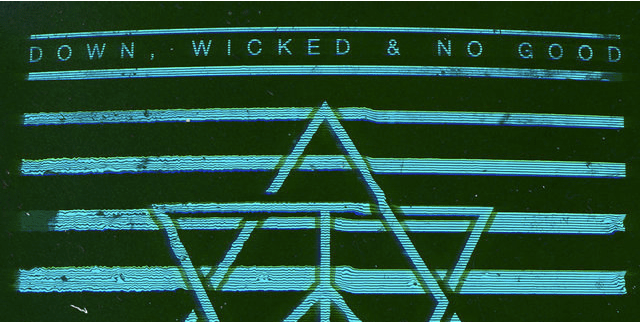 Down, Wicked & No Good is out now and you can buy or stream it here! On a side note, the band will also be taking over Depeche Mode’s Facebook in celebration of the release, pretty cool eh? !